Moody Ministries has recently redesigned their website and are in the process of reworking all of their sites to integrate better. Kidology’s own Director of Web Operations, Steve Tanner, has some connections on that team and has been showing me the work they’ve been doing, and we’ve been impressed! So it came as a surprise when I got a call from Moody (via a totally separate connection) asking if they could do a little story on me since I am a Moody grad. I was honored! I have MANY Moody connections in my life! Moody student introduced my mom, as a little girl, to Jesus. D. L. Moody, through a chain of conversions led Billy Graham to Christ, who in turn led my dad to Christ. My father-in-law graduated from Moody. His daughter (my wife) graduated from Moody. Received my Call to ministry via a Moody grad. My sister Melissa has attended Moody. My mom worked in the Graduate School. My dad made the cover of Moody’s Servant Magazine! I was married in Moody Church. 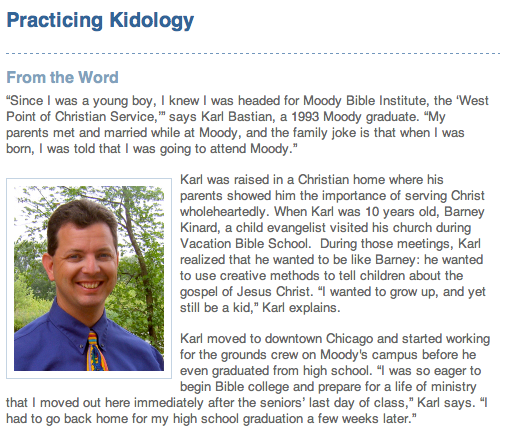 Kidology’s first endowed student scholarship is the Patti Bastian Memorial Children’s Ministry Scholarship at Moody Bible Institute. Is it any wonder I love Moody? Congrats Karl, way to go!! You Da’ man.